If you look at what happens when things go wrong for kayakers, a common thread that runs through many incidents is that group members become separated. I can think of a number of scenarios right here in Clayoquot Sound where this has happened. Many moons ago, three whitewater paddlers tried to paddle from Tofino to Hot Springs Cove. A friend of mine was camping on Vargas Island and watched them leave shore, heading north. They paddled in good whitewater formation, single file. The westerly began picking up and soon was howling. Realizing that they were not going to make it around the outside of Flores Island against such strong headwinds, the first two paddlers pulled in behind an island to discuss the matter. The third paddler had fallen behind and could not see his friends up ahead. Desperately trying to catch up, he paddled right by the island and failed to notice his companions bobbing there in the overhead waves. Nor did they see him, even though they were watching for him. My friend on shore noticed two of the three paddlers returning to the beach about an hour after they had left. They figured their buddy had been unable to paddle into the winds and must have turned back. Were they ever surprised to learn he had not! What to do then? How do you find a needle in a haystack, when that needle is bobbing up and down in waves that hamper visibility? They talked to a homesteader living on the beach and used his vhf radio to call the Coast Guard. The incident resulted in an all-night search. Finally, a kayak was spotted in Hot Springs Cove and the missing paddler was located, soaking in the springs. Evidently he was irate at being accosted by the search and rescue personnel, unaware of the time, energy and tax dollars that had been devoted to the search as a result of his friends' justifiable anxiety. That whole scenario could have been avoided by simply paddling in a line abreast, rather than single file. It's difficult to look over your shoulder in big waves. It's much easier to simply glance to both sides. Maintaining voice contact is a good guideline in terms of how close together to paddle. In this case, it would have been easy to make decisions such as, "Let's get out of this wind for a minute," and, "Let's head back to the beach." Another incident occurred more recently. Two brothers were paddling south from Hesquiat Harbour to Tofino on a westerly tail wind. The two became separated. The trailing paddler, trying stoically to catch up, failed to notice the entrance to Hot Springs Cove where his brother had sought shelter, and paddled right on by. He decided to make landfall before dark, and came in on a pocket beach on the outer coast of Flores Island. Ironically, I was also returning from Hesquiat that day, having hitched a ride on a water taxi (cheater!). As we passed that very cove at sunset, I was explaining to another passenger how I have dubbed it "No Landing Beach" because the tiny sand beach looks so appealing on the chart, and also from the water, until you are right on top of the big rock hidden in the surf in the middle of the beach. Sure enough, this fellow had learned about "No Landing Beach" the hard way. He had injured his shoulder on the way in and was stuck there. He was rescued the next day when a local float plane pilot noticed his huge message written in the sand: help! Just last summer I was cruising the outside of Vargas Island when the Coast Guard inflatable pulled up. Seemed a kayaker had returned to Tofino without his partner and a search was initiated. Several hours later, the other paddler made it in under his own steam, no harm done. But imagine the anguish and distress generated in these situations, not to mention the waste of tax dollars and time on the part of the searchers. These scenarios could have been prevented if the paddlers had stayed together. For groups of recreational paddlers, it's important to discuss issues such as leadership and group formation well before arriving at the put-in, preferably over beer and nachos, while planning your trip. 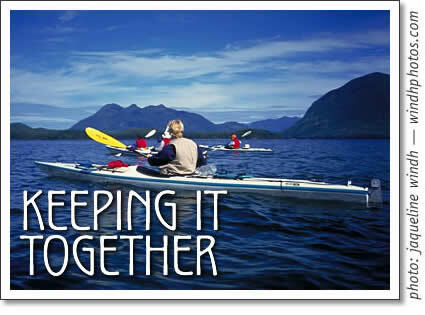 If you're paddling with two people, side by side works great. You can see and hear each other at all times. Three people can paddle line abreast. Four is stretching it so you could switch to two pairs following each other. With five or more people it's easier to select a leader, and stay with that person. With larger groups, it's a good idea to appoint a strong, experienced paddler to paddle sweep, that is, to stay at the back of the group with the slower paddlers. Set a pace that everyone can easily maintain. If someone is slowing everyone down, consider getting them into a double, or at least keep them up front, since you will be paddling their speed anyway. It's much easier psychologically to paddle up front than to trail behind. Remember, sea kayaking is not a race. Try to find compatible partners, and once you're on a trip with someone, stick with them. As the examples above show, it can be next to impossible to find someone in wind and waves if they have been left behind. I often hear paddlers say, "We'll stay together if conditions get rough, but it's so calm today, there's no need." I believe that if you can't paddle in a tight formation in flatwater, you will not be able to do it in choppy conditions, even if you are able to locate each other. Get out and practise formation paddling in calm conditions. Make a game of it. It may pay off one day.